Imagine driving your electric car on a long road trip across the country, without ever having to worry about checking your route for charging stations. Scientists and researchers are working hard to turn this scenario into reality and here, we take a closer and more detailed look at the technology behind the concept of being able to wirelessly charge electric cars. Currently, and despite their increasing popularity, there are still a number of downsides to owning an electric car. At the moment, they are still very much limited by the mileage they can cover on a single charge. This leaves the vehicles dependent on charging stations at home or in public areas. The former may increase personal electricity costs, and the latter are still not widely available in many countries. Some researchers now assert that these vehicles will be more sustainable when systems that can allow them to charge as they drive will be developed. This will involve the transfer of electricity over the air, rather than through cables. Whilst this concept certainly may seem futuristic, it is closer to practical reality than many of us might realise. Now, a research group from Stanford University have demonstrated the ability to transfer electricity across a certain area in a way that uses conventional equipment. Should this method prove reliable and reproducible, it may well pave the way for electric cars that charge continuously on the go. This could drastically improve the range of these vehicles and certainly should influence their uptake for the better. Electric cars are an attractive alternative for those who do not want to use fossil fuels. They are powered by batteries which ‘fill up’ using power from the main grid using conventional outlets connected to special cables and adapters. Whilst this sounds great, it can take many hours for a car’s battery to re-charge when it has run low. In addition, the range of the car, or how far it can drive, is also limited by the capacity of this battery. Some manufacturers such as Tesla claim increased range with every new model they release, but in practical tests this range is often lower than the published values. Therefore, researchers and industry figures have now turned their attention to the development of a form of charging that takes place independently of normal ‘wired’ grids – wireless electric transfers, in other words. Many people may have their doubts about this new transmission standard. They may perceive it as unviable, or at the very least challenging to implement. This form of wireless charging is based on near-field magnetic field manipulation, as opposed to radiative electricity, with researchers working in this field claiming that it can deliver an efficient supply over an area roughly proportional to the size of the resonator used. However, this efficiency can be affected by variables associated with the operating conditions. This method of wireless transfer may also be safe to pass through living tissue, meaning that it may also deliver power to medical devices and implants one day. These new, preliminary forms of wireless electricity are admittedly hampered by the resonance frequency of this electromagnetic field. This frequency may need to be constant between the ‘receiver’ and ‘transmitter’, or in the case of wirelessly charging electric vehicles, the car and the road. Therefore, if one moves, the entire circuit may be broken unless the frequencies are precisely re-adjusted. In addition, both receiver and transmitter need to be very well-aligned for anything like efficient transmission. These limitations may translate to a system that is not robust enough for real-world, long-term usage. To address such issues, a team from Stanford have reported the development of a new system, featured in a recent issue of Nature, in which the problems with wireless circuitry well may have been eliminated. In their experiment, the researchers replaced the need to constantly re-adjust the frequency with oscillation in the electromagnetic field. The scientists Shanhui Fan, Xiaofang Yu and Sid Assawaworrarit used a conventional resistor and voltage amplifier to automatically adjust the frequency in response to movement in the circuit. This enabled the team to power an LED lightbulb from about three feet away, with consistent brightness as the bulb was moved to this distance. The system achieved an efficiency of about 10 percent, but the Stanford researchers are confident that more work and custom parts could increase it by about 80 percent. Wireless car charging may already be familiar to those waiting for the next generation of Audi low-emission, or e-tron, vehicles. The A8 model from this line-up features a cable-less charging system embedded in a floor-mounted platform. 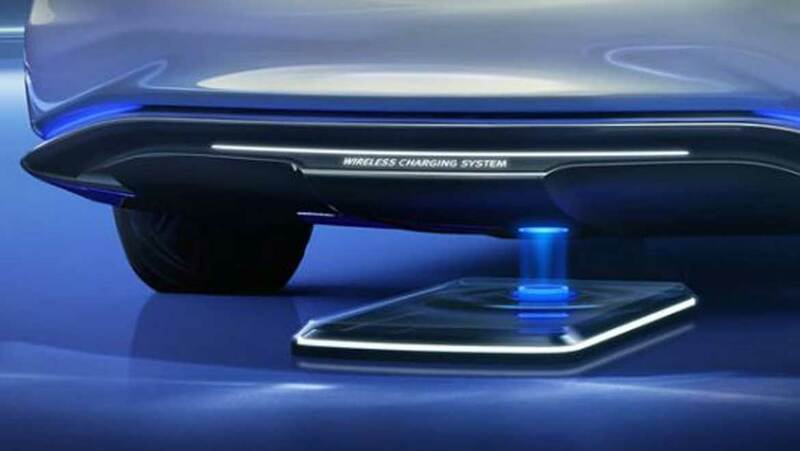 The essential idea is that this platform can be installed where the car is normally parked, and thus power up like a smartphone with a wireless charging dock or pad. The technology behind it seems impressive, although there are some obvious drawbacks. One is that the new-generation charging station may not deliver power to the car, which has corresponding receivers on the bottom of its chassis, properly unless both are lined up perfectly. A good comparison is that even high-end phones require precise alignment on their wireless charging pad in order to successfully charge the battery. In addition, there are no details as yet concerning the modifications that would have to be made to a home or garage in order to install such a platform. The Audi offering seems interesting, but continuous on-the-go charging may be a more convenient and universal solution for the electric cars of future generations. If this new wireless system proves feasible, it will resemble Audi’s solution, at least superficially. Researchers propose that it would take the form of wire coils placed under a road surface, which would transfer power to similar coils on the underside of a car. The electricity would be transmitted via oscillation as the car moves along the road in question. This might also facilitate a driverless system, in which location and other data could also be transmitted through the wireless connection. In general, over-the-air power has come a long way since the creation of the Tesla coil. The new experimental system developed at Stanford could prove the necessary missing link between electrical power, which could be generated by renewables, and compatible vehicles that could run for longer whilst charging their batteries on the go. Medium-range wireless power may also power other devices in our lives such as smartphones, and may also help those in need of medical enhancements such as cochlear implants. It certainly sounds as if the next generations could well be living in a world where the need to stay within the length of a charging cable for both our phones and our cars, is no more. Assawaworrarit S, Yu X, Fan S. Robust wireless power transfer using a nonlinear parity–time-symmetric circuit. Nature. 2017;546(7658):387-90.